Graffiti artists take no responsibility for the act, denouncing it strongly, and the enigmatic graffiti has led to a lot of speculation on the Internet with news media and police requesting people to contact them if they know anything. I (as well as others I presume) have Web mined for clues. Wordnik gave nothing on “gelwane” or “gelwan”. English Wiktionary doesn’t give much either: gel (a jelly? Turkish imperative of “come”?) wane (decreasing? )… Some have pointed to “gel wane” in Kudish means “people” and “lesson”. So are we dealing with a Kurdish speaking person who want to give the people a lesson? Or a lesson from the people? Probably not. So we might be dealing with a fairly young guy from Jelling, not good at spelling, inexperienced in graffiti and in the possession of a PlayStation Portable (or related apparatus) and the Final Fantasy Tactic game with nothing else to do on a Friday evening. Based on the “Money over bitchez” tag I would add that the young perpetrator has an interest in rap music (if the train station graffiti is made by the same person). “P.E.R.K.e.r” would indicate that he is a bit of a racist. Now the latest news is that they have found the vandal. It is a 15-year old local boy. Whether he is a rap appreciator and the owner of a PlayStation is not revealed. This entry was posted in society and tagged graffiti, jelling. Accusations of fraud – both real and researcher fraud – target high-profile Danish glossy neuroscientist Milena Penkowa from the University of Copenhagen. It has been frontpage news in Denmark for some time now. Want an English introduction to the case as it stood in the beginning of January 2011 then read the Nature News article Nature News. Since then the case has grown. Now the central damaging allegation is that she falsified documents stating that a Spanish company was involved in an experiment with many hundreds of rats. An element of the Milena Penkowa case cannot be discussed in public because of “legalities”. Journalists and researchers generally know the details of that case but are prohibited from mentioning them in public. Information seekers that want to find out about it may either need to seek a person in-the-know or do a bit of triangulation with an Internet search enginge. Hmmm… Aren’t the Danish variation of free speech, The Ytringsfrihed, having a problem here? Some have questioned her overall scientific contribution. If you pubmed Penkowa you’ll see she has first-authored 33 PubMed papers and the total listing counts 98 PubMed papers. Most of her research seems to revolve around the protein metallothionein. The blog entry from Morten Garly Andersen states that “Penkowas first big article, which came in 2000 in the scientific magazine Glia has her coauthor, the Spanish Professor Juan Hildalgo, now retracted.” That statement seems not to be true: “Strongly compromised inflammatory response to brain injury in interleukin-6-deficient mice” is from 1999 and is with 114 citation her most cited article on Google Scolar. As far as I know this has not been retracted. As far as I can determine her Google Scholar h-index is 32. That is quite much compared to her young age. Quite impressive I would say. On the other hand among her first authored papers I find no journal I can recognize as a high-impact journal. From a medical researcher one would have expected at least one article in, e.g., The Journal of Neuroscience. So we may not be talking about ground-breaking science. She has two patents, but I am not presently aware of any application of these patents. Correction 22 August 2011: Here I am definitely wrong: She has an article in Journal of Neuroscience called CNS wound healing is severely depressed in metallothionein I- and II-deficient mice! Penkowa has claimed that she was under contractual obligations with a company. But can a researcher sign such a contract without the university approving it? Has the university approved such a contract? Has the university investigated whether such a contract exists? One commentator noted that Helge Sander exited as Minister of Science one month prior to Penkowa’s suspension from the university. Is that a coincidence? In the begining of January Chairman of the Board of the University of Copenhagen found that “Penkowa’s research is already being treated by the relevant authority, The Danish Committees on Scientific Dishonesty (DCSD)”. I presume he no longer will accept his own statement as the university has involved the police in the investigation? The university has reported Penkowa for falsifying documents. Even if the allegation is correct it is probably the case that the police cannot do anything about it because too many years have passed. The alleged falsification have supposedly taken place back in 2003. A document falsification allegation case that expired has recently happened for a Danish businessman with a high-profile politician wife. In that case the Danish police simply rejected the case. Fraud? What fraud? The university has reported Penkowa to the police for fraud (real fraud – not science fraud). But to commit fraud you need to gain value from it. If the allegation is correct what she gained is not clear. One “gain” was to avoid being dragged through a scientific dishonesty process, but is that a “gain” in the sense of that paragraph of the law? Has the university lost any money on that? It is probably not the case that she gained her degree based on the documents – she simply left out the problematic study from the disertation. So fraud? What fraud? Her collaborator fra Barcelona has said little. Penkowa has two papers in Glia from 2000: Impaired inflammatory response and increased oxidative stress and neurodegeneration after brain injury in interleukin-6-deficient mice and Metallothionein I+II expression and their role in experimental autoimmune encephalomyelitis (as far as I can see the contested table is Table 1 with 784 rats. The method section reads “Female Lewis rats, weighing 180-200 g, were obtained from the animal facilities of the Panum Institute in Copenhagen”). I find his name on both papers. Has he anything to say? If Copenhagen researchers find it strange that over 700 rats have been used in a study, why does this Spanish collaborator and co-author not find that strange? Now, hold on! Hold on! On the 8th February 2011 he actually came forward: According to Danish news the Spanish collaborator has asked the editor of “Glia” to retract the article. So it clarifies that aspect. Then February 9th Danish news paper BT got a strong statement from the Spanish researcher saying he is not a second in doubt that she has lied about the rats and he used words such as “not a friendly person”, evil and demanding. If Penkowa writes “Female Lewis rats, weighing 180-200 g, were obtained from the animal facilities of the Panum Institute in Copenhagen” in her paper then why was the university satisfied with Penkowa’s explanation that part of the rat study was performed in Spain? Milena Penkowa received the EliteForsk prize. It is unclear who promoted her. Ralf Hemmingsen ok’ed it even though he must have known about the suspicions against Penkowa. Minister of Science Helge Sander has personal ties to Penkowa. Has there been a direct or indirect pressure from Sander on the people in the nomination committee? Who can investigate a former minister? Surely not the university. Penkowa stated in a letter that she had been to a funeral following a traffic accident involving her mother and sister. At the later party at the university her mother showed up. Did any one at the university remember the letter? Did they write it off as a white lie composed by a stressful person? Ralf Hemmingsen has apologized for the treatment the three members of the Penkowa’s original 2001-2003 doctoral committee got. However, it still an open question if committee members did a reasonable scientific job. Prominent Nordic neuroscientists Per Andersen and Anders Björklund critized the work of the committee. So where does that leave us? Was the work of the committee not good enough? Did Andersen and Björklund not get enough material or time to evaluate. Is Andersen and Björklund’s criticism unfounded? Should we have an investigation of the investigation of the investigation? Committee members said in 2011 they investigated the possibility of submitting Penkowa to the Danish Committees on Scientific Dishonesty back in the early 00s but were adviced not to do so as it could be regarded as a breach of confidentiality. Apparently the members reluctance to call in DCSD put Ralf Hemmingsen in a catch-22 and was the reason he called in the investigation with Andersen and Björklund. Is the claim of the committee members really true? Shouldn’t such members be allowed to submited to DCSD? Some have critized that Ralf Hemmingsen for not involving Andersen and Björklund in the investigation about the 784 rats. But is that critique fair? The investigation would involve looking through bureaucratic documents (bills, invoices, lab reports) and really not scientific material. Do the critics think that busy widely known neuroscientists Andersen and Björklund should spend their valuable time looking into such things? Penkowa’s latest statement from February 12th says the following: “That company has of course existed, like the persons, that at that time was involved and performed the experiment, also existed. The university called the company to get it confirmed. The one, Weekendavisen has called in 2010, is in all likelihood not the same person”. So either the newspaper Weekendavisen and the Spanish lawyer the University of Copenhagen employed for investigating the whereabouts of the existing or nonexisting Spanish company have made a major blunder or Penkowa has now shown a considerable strained relationship with reality. Nu er jeg så gammel, at jeg husker en sag for omkring 40 år siden, hvor en kvik og dejlig dame blev “båret frem” til en medicinsk doktorgrad af ældre “velgørere” på Københavns Universitet. Bagefter var der nogle unge forskere, som pillede doktorgraden fra hinanden – med en hel del røde ører til følge. De unge læger blev i øvrigt bagefter blacklistet som hævn, så vidt jeg ved. Det kunne man gøre dengang. Photo: A Mazda MX-5 roadster. A photo by Mauricio Marchant from Wikimedia Commons with license CC-by-sa. Penkowa has a similar car and has been photographed in it a couple of times. This entry was posted in science, society and tagged fraud, mazda, Milena Penkowa, neuroscience, science, University of Copenhagen. Danish UNESCO World Heritage Site runic stones in Jelling have been vandalised with graffiti between Friday the 11th and Saturday the 12th February 2011. The police have stated that they are without clue of who did it. The word “GELWANE” (or “GELWAN E“) is written in darkgreen on the stone(s) and apparently also on other objects. So what does tell us? Boris, one of my Facebook friends friends, with Sherlock Holmes-like capabilities for graffiti interpretation notes the sloppiness and capital letters of the badly executed spraying and concludes that we here are not dealing with an experienced graffiti-painter. So who then? Searching Wikipedia for “Gelwane” gets you nothing. Neither does a search on “Gelwane” or “Gelwan” with De Gule Sider reveal anything. Endocrine system researchers annoyed by lack of research funding? Or are we dealing with marijuana researchers? Jelling turist office people noting how much extra publicity The Little Mermaid is getting each time her head it sawn off? One comment on the Uriasposten (a blog that usually not think well of muslims) pointed to a character called Gelwan in the game Final Fantasy Tactics. Indeed if we search English Wikipedia we get two hits: Treaty of Königsberg (1390) and Characters of Final Fantasy Tactics (“One of Goltanna’s liegemen, Minister Gelwan, sought to switch to Larg’s camp; through Gelwan, Dycedarg arranges for men disguised in Southern Sky livery to kidnap and kill Ovelia.”). According to Wikipedia the game is for Sony PlayStation. A variant seems to have been made for Nintendo DS and a newer version for the Sony PlayStation Portable. So we might be dealing with a fairly young guy from Jelling, not good at spelling, inexperienced in graffiti and in the possession of a PlayStation Portable (or related apparatus) and the Final Fantasy Tactic game with nothing else to do on a Friday evening. His parents may look forward to a big bill for damages. This entry was posted in Uncategorized and tagged denmark, graffiti, jelling, vandalism, worldheritage. Danmarks Radio’s So Ein Ding, had an evaluation of Open Source-based Ubuntu. The program is available from DR NU. Host Nikolaj Sonne explained about the download, installation and operation of Ubuntu. With Ubuntu 10.10 he ran into a serious error with the mouse and keyboard not being recognized after an update and he went back to Ubuntu 10.04 LTS (AFAIR). After that he found Ubuntu to work ok. He didn’t seem to run into any driver problem. He had though some negative comments about the interface. through Ubuntu. You do not have to rely on third-party organizations to download and make updates. Eight minutes into the program a .NET developer (hopefully?) wrote that “Ubuntu is slaughtered in so ein ding”. However, I wouldn’t say that. Sonne gave an overall grade of four out of six. A sort of ok grade. I have had some problems with Linux and Ubuntu. With a Dell laptop and Ubuntu 10.04 I experienced occational freezes. With Ubuntu 10.10 I have never experienced them. That computer is running fine now. As a wannabee electronic musician I have installed Ubuntu Studio packages and seem to have configured myself in a wrong direction. Standard GUI sound controllers no longer work and I sometimes have to find alsamixer to adjust the volume. Overall I have a fair amount of problems with the more advanced part of music on Ubuntu: Jack und so weiter, e.g., one nice program ZynAddSubFx seems not to work well with Jack. I may very well be that I configured the computer badly. Eduroam which should provide seamless wireless login on many European universities does not always work. On occasions my mouse button disappears, but can reappear if I touch the touchpad. Switching between a big external screen and laptop screen usually requires a “trick”. I wrote that the wireless network was unstable. I don’t recall that now. I works fine now. Many nerds might have been interested in the program with Ubuntu as the homepage for the program crashed. This entry was posted in Uncategorized and tagged dr, linux, soeinding, ubuntu. How many blog posts or status updates can you write? So you are able to write an over 600-digit long number of Facebook statuses. — If they are suppose to be different. I guess it is not so interesting to repeat a message. It will take many many years before we repeat ourselves even if we type really fast – well over a 500-digit long number of years. I recently ran into an announcement stating that they in Tübingen university hospital has got a combined MRI/PET scanner. Wow, I thought. This is really news. I had only heard of combined CT/PET scanners and wasn’t aware of that they could combine MRI and PET. I should give such a news a blogpost or at least a tweet. As a read the announcement it occured to me that I already had done a blogpost on combined MRI/PET scanners some years ago. That was on the late ‘Machine Culture’ blog (practically the only memory the Internet has of that post is a reference on a page in the Internet Archive: “Simultaneous PET/MR brain scanner”). So it seems that I am beginning to repeat myself with around 3.5 years interval. That number is not in correspondence with the above calculate number. I note the MRI/PET scanner they got in Tübingen is a “Ganzkörper” type. Maybe I should focus on “Ganzkörper” this time instead of repeating myself. Maybe I should also pop in and have my head examined: A Ganzkopf-MR-PET scan. This entry was posted in science and tagged facebook, mri, pet. So it is around half a year ago the WikiSym 2010 and Wikimania 2010 conferences took place in Gdansk. Before the conference I paid the registration for WikiSym. In another transaction I paid Wikimania registration and the shared dorm via PayPal. They were good meetings and I have written a bit about them here and here (I still seem to miss a rightup of the Wikimania meeting). When I got back to Danmark I wanted to get my travel expenses reimbursed from my university. Just as I was handing in the information August 3rd I got an email saying that my PayPal transaction was reversed, so I stopped the reimbursement. Apparently, I was not the only one it happened to. Jon from Norway reported it too, as well as a number of others. No one on the Wikimania mailing list seemed to know much, and in the end of August Jon seemed to have been the last to ask Any news on this? with no reply. One should think that someone is missing these money? Somewhat of a mystery. Well, I waited. I waited so long that my university changed travel reimbursement system and the papers that I had filled out were no longer valid. At new year 2010/2011 I still hadn’t heard of what to do, so I began to to use the new online reimbursement system. I had an initial login problem there and got around nine to ten people involved in the problem stretching over several days. Finally, our system administrator superman came up with a useful guess that solved the login problem and I smoothly completed my travel reimbursement for WikiSym. Not long after I had completed the reimbursement (was it within hours?) I got an email from an executive assistant at the Wikimedia Foundation saying that they were missing the payments and could I please pay! The payment should go to another PayPal account. Just to check I looked at the email header and saw that the email didn’t seem to originate from the Wikimedia Foundation but instead from Gmail. I had then already emailed the person and received a reply, so I guess things are alright. :-) There must be email forwarding somewhere. After trying to pay the second time I got acknowledgment both from the Wikimedia staff and PayPal around January 21st. Registration payment hows and wheres were not the only mystery of Wikimania 2010. The movie mystery was another. The Polish company iStream setup parallel realtime streaming. Neat. (The image above shows me while I screengrab an image of me) However, as far as I understand the recorded movies should also be ogg-theora’ed and put on Wikimedia Commons Open Access media archive. This step seems never to have happened. I have seen a few emails on a mailing list asking about the videos but now one has an explaination. The realtime streaming was fine as the rest of Wikimania. However, I was looking forward to see how silly I looked on video. Maybe the video people have taken a look on my performance and found it best not to make it public to spare me the embarrassment. Then thanks. Organizing Wikimania is a tough job done by more or less volunteers with perhaps little conference organizing experience. I don’t envy the organizers. Scientific conferences, such as the Human Brain Mapping conference, usually have an organization behind with paid staff, pays an event organizer company for management, pays a publisher for handling incoming manuscripts and have an overlapping organizing committee. The conference registration fee for such conference is typically also much higher than Wikimania. Wikimania is really a bargain. There has recently been some discussions on the Wikimania mailing list beginning when Harel Cain suggested having the conference every second year. The most constructive handle on the Wikimania organizing issue came perhaps from Phoebe Ayers that one rainy Saturday afternoon sat down a drafted a Wikimania Handbook. Hopefully that wiki-approach will help the organizers. Lets hope for some more rainy days for Phoebe Ayers in Davis, California. I thought it never rains in California. Maybe its a Northern/Southern California thing. BTW there is a call for papers out on WikiSym 2011. This time WikiSym will not be co-located with Wikimania. WikiSym will take place at the Microsoft Research Campus in Silicon Valley. — that is, in the part of California where it probably sometimes rains. This entry was posted in Uncategorized and tagged wikimania, wikimedia, wikisym. For integrating knowledge from neuroimaging and related areas we continue to expand structured data-containing wikis. The Brede Wiki now contains 1,707 content pages describing 415 scientific journal papers. 114 of these pages contain stereotaxic coordinate data from neuroimaging studies published in the papers and 87 pages contain data from personality genetics association studies. Furthermore the Brede Wiki describes, e.g., 291 brain regions of which some are deeply linked to corresponding items in the AAL digital atlas and BAMS, Brede Database, ConnectomeWiki, IBVD and MeSH databases. Functions from the Brede Toolbox can now download data from the wiki and process the data within the Matlab environment. Another wiki, the Brede Wiki for personality genetics, has been expanded to contain data from 87 scientific genetic association studies. It is a specialized wiki with easy data entry and online plotting and mass-meta-analysis. The wiki is presented on the public Web and its data can be downloaded in a variety of formats and plotted in various ways. 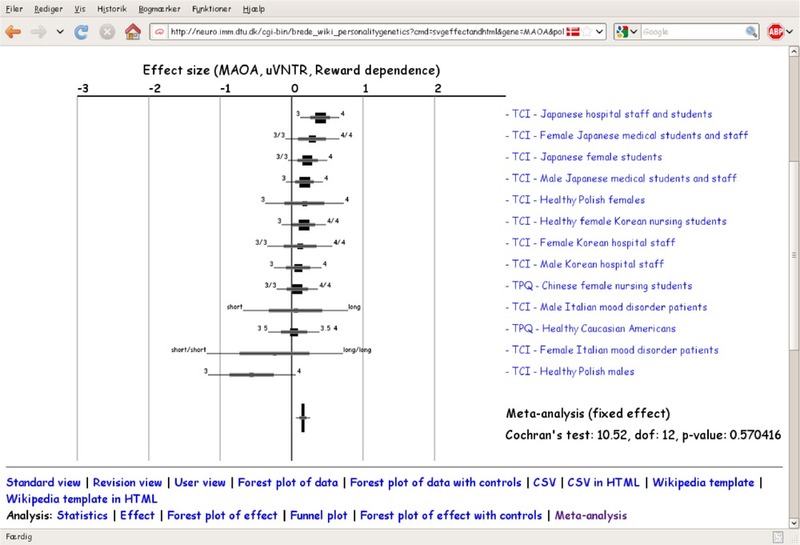 The mass-meta-analysis indicates some of the most promising associations to be between the MAOA-uVNTR genetic polymorphism and the personality trait reward dependence (see the screenshort) and between 5-HTTLPR and agreeableness. I am not utterly satified with my scientific paper output of 2010. My time is split betweet two projects: CIMBI and the social media mining project Responsible Business in the Blogosphere. Furthermore, I have also begun to teach the Python Programming course. Jan Kalbitzer’s seasonality paper goes a long way back at least to 2008. This entry was posted in Uncategorized and tagged bredewiki, cimbi, metaanalysis, neuroimaging, wiki.